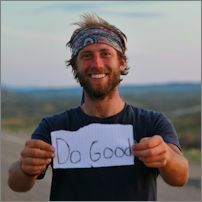 Rob Greenfield is an adventurer and activist on a mission to affect positive social and environmental change. He lives off the grid, in a 50 sq.ft. tiny house in San Diego, California where he harvests rain water for all of his water needs, uses only solar power, and of course composts his own poo! 50 sq.ft. is truly tiny but he does it as an extreme example to get people thinking about the benefits of living more simply.